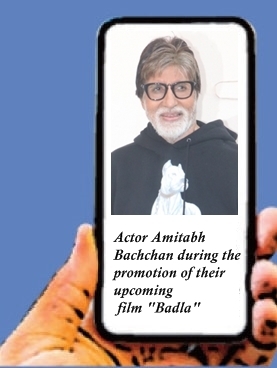 At the outset, Mr Bachchan in his interview with IANS wanted to send a message over something that has caused him great pain and distress in recent memory: "Before all else, come laden with our hearts and mind in condolence and prayers for the brave hearts we lost in Pulwama, and the brave hearts that fight and protect us each hour for our safety and security!" During the course of the interview, there are many matter of fact, phlegmatic and perfunctory replies from one of the most popular film stars of our time, the strong underpinning of modesty coming through at all times. Very clear that the aura and adulation is undeserved, he reckons, but fanboys and fan girls think otherwise. Epithets, hyperbole and verbosity have come his way, but he wonders why, such is the self-effacement and humility. Yet people remain in his thrall. The Inquilab in him (name given to him at birth by his father Harivansh Rai Bachchan, but later changed to Amitabh at the behest of Sr Mr Bachchan's poet-friend, remains undimmed searching for fulfillment as an actor. Another day another job then ... But I have worked in the past with Sujoy, I liked the story and the director, the element of suspense and thrill in the story line got to me. Sujoy has made Kahaani and is restless, seeking perfection from his artistes, very clear in his thought process and how he wants to roll with it. He understands the grammar of cinema intelligently. *A fulfilling journey where you have worked with great directors and actors, would you say Hrishida and Pran are your favourites, they were both lucky for you in different ways...you made 10 films with Hrishida? *Lots of top American actors pursued the method acting model as crafted by Lee Strasberg whom we then saw as Hyman Roth in Godfather 2 pitted against his pupil Al Pacino, it was riveting cinema. When you hit your strides, did you take acting classes or consciously or unconsciously imitate someone or does anyone influence your work? No, I never took any acting lessons, nor did I consciously or unconsciously imitate someone, unless asked by my makers to do so .. and there were a few such occasions! I have no idea on the method of acting, and have never taken or hit any strides. *One hears of Ranveer Singh living and breathing his roles these days...or getting into character, I am sure many of your roles would have required major preparation, for instance 'Pa' or 'Black', if you could explain your craft for such difficult roles? *You have always said that you have been fortunate in your acting career -- me akela hi chala ja rha tha, log judte chale gaye aur karvan banta chala gaya -- is that the credo that has determined your life? *During a large part of your peak years, you actually had a very difficult relationship with media, including a major part when media boycotted you...and you now have a fabulous relationship with media. Explain this paradox, and did you work towards bridging the divide, what led to it in the first place? I am certain you are more than aware that one can never be too close to the media or too far away from them! The media is the fourth estate, the conscience of the nation. I shall have the capacity, or the audacity to live with my conscience, but not that of the media's. It would be foolish of me to think so. *Fifty years of greasepaint and yet the fire remains undiminished. Where do you get your energy from? Or is it respect for work which defines your underlying ethic? I am at loss as to why you or many others ask me this question? *In the immediate years after 'Saat Hindustani', there were many flops but some seminal work even in a small role in Sunil Dutt's 'Reshma aur Shera', memories of that experience and any other before 'Anand'? *Back in Sherwood, did you do any Shakespeare in school, somewhere in your baritone and acting, there is a touch of the thespian which emerges in many of your recent films, is it right to make this connection? *Is Hindi cinema in good hands with a New Gen of young directors and actors and middle-of-the-road cinema and actors like Ranveer Singh, Ayushmaan Khurana, Alia Bhatt, Rajkumar or even the Sher from 'Gully Boy' telling simple tales that resonate with people? Biopics or true life stories with a slight amount of poetic licence seem to be doing well, Akshay has perfected this art form, you too are doing 'Jhund' with Nagraj Manjule. Tell us if this is due to the absence of original scripts or they are the flavour of the season. Times and circumstances change. They change for every profession too. Films are no different. The present generation is an audacious package of incredible talent! I am in immense admiration of them, and am fortunate that I get to play a small part in their company. It is an education for me. They provide a different and alternative world-view and this is educative. Never ever underestimate the credibility, dexterity, adroitness and skill of the writers and makers of today's entertainment world. They have been the reason and cause of the flourish and proliferated blossoming in our creativity for the past 100 + years! To have a meaning and standing after 100 years is not a joke. It deserves respect and dignity. Originality is a dichotomous terminology. It needs to be used and expressed most carefully! *Do you get irritated with the fact that now actors have to sing for their supper as in market and promote their films aggressively and devote a lot of time and energy which wasn't the case when you were the undisputed 'Shahenshah'. How and why have things changed in tactics? Look around and about you, dear sir .. not just actors, but does not everyone in today's times have to sing for their supper? *From eight releases in a year in your time, the stars now do one movie in a year or even two years, is this a function of New Age commerce? It is a recognition of better management, both financial and personal. The good thing is that music and melody are back in Hindi cinema, Music is enjoyed by one and all, music plucks the chords and strings of our souls. *From the age of parallel cinema to small cinema like 'Raazi' and 'Badhai Ho' taking on pulp, how has Hindi cinema evolved? Has the palate of Hindi filmgoers changed or has the definition of pulp itself changed? I do not know what is 'pulp' or 'parallel'. Cinema is cinema -- size and girth, small or big are measurement tags on apparel. The palate of every generation in every corner of the world, changes, not just for film but for every walk of life! *Any memories of 'Geraftar' for that is probably the only movie where Rajinikanth, Kamal Haasan and you shared screen space? It was an honour, privilege and a most humbling experience, to be in the same film as Rajni and Kamal.